Backpacks come in all sizes, colors, fabrics, and shapes and help kids of all ages express their own personal sense of style. And when used properly, they’re incredibly handy. Many packs feature multiple compartments that help students stay organized while they tote their books and papers from home to school and back again. Compared with shoulder bags, messenger bags, or purses, backpacks are better because the strongest muscles in the body — the back and the abdominal muscles — support the weight of the packs. When worn correctly, the weight in a backpack is evenly distributed across the body, and shoulder and neck injuries are less common than if someone carried a briefcase or purse. As practical as backpacks are, though, they can strain muscles and joints and may cause back pain if they’re too heavy or are used incorrectly. Here’s how to help kids find the right backpack. Although many factors can lead to back pain — increased participation in sports or exercise, poor posture while sitting, and long periods of inactivity — some kids have backaches because they’re lugging around their entire locker’s worth of books, school supplies, and assorted personal items all day long. But most doctors and physical therapists recommend that kids carry no more than 10% to 15% of their body weight in their packs. To know how heavy backpacks can affect a kid’s body, it helps to understand how the back works. The spine is made of 33 bones called vertebrae, and between the vertebrae are discs that act as natural shock absorbers. When a heavy weight, such as a backpack filled with books, is incorrectly placed on the shoulders, the weight’s force can pull a child backward. To compensate, a child may bend forward at the hips or arch the back, which can cause the spine to compress unnaturally. The heavy weight might cause some kids to develop shoulder, neck, and back pain. Kids who wear their backpacks over just one shoulder — as many do, because they think it looks better or just feels easier — may end up leaning to one side to offset the extra weight. They might develop lower and upper back pain and strain their shoulders and neck. Improper backpack use can also lead to poor posture. Girls and younger kids may be especially at risk for backpack-related injuries because they’re smaller and may carry loads that are heavier in proportion to their body weight. Also, backpacks with tight, narrow straps that dig into the shoulders can interfere with circulation and nerves. These types of straps can contribute to tingling, numbness, and weakness in the arms and hands. Kids who carry large packs often aren’t aware of how much space the packs take up and can hit others with their packs when turning around or moving through tight spaces, such as the aisles of the school bus. Students are often injured when they trip over large packs or the packs fall on them. Carrying a heavy pack changes the way kids walk and increases the risk of falling, particularly on stairs or other places where the backpack puts the student off balance. 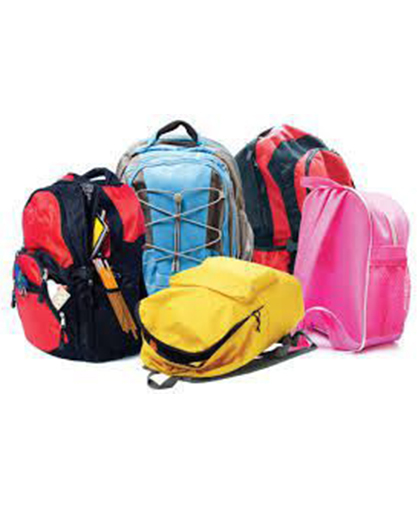 Despite their potential problems, backpacks are an excellent tool for kids when used properly. But before you buy that trendy new backpack your kid or teen has been begging you for, consider the backpack’s construction.